At a press conference in London, OnePlus took the wraps off its next flagship smartphone. 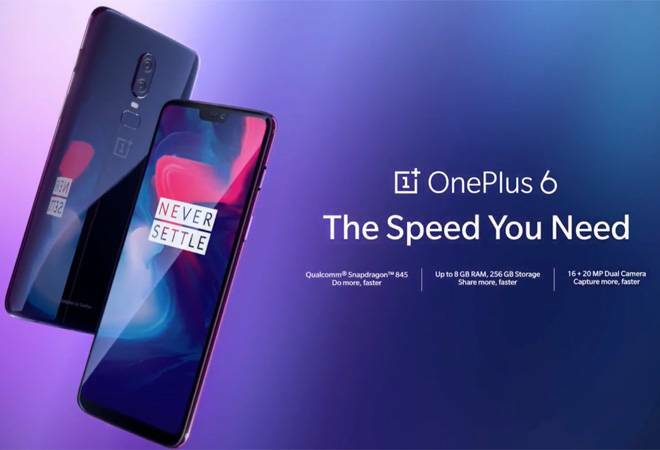 With the tagline - The Speed You Need - OnePlus claims this phone to be the company's fastest phone ever made. It also features top-of-the-line hardware with the Oxygen OS based on Android 8.1.0. After numerous leaks, rumours, and information coming directly from the company, the OnePlus 6 finally sees the light of the day. The OnePlus 6 has an all-glass design protected by Corning Gorilla Glass 5 and "daily water resistance". The front is dominated by a 6.28-inch full Optic AMOLED display with a 19:9 aspect ratio, offering 84 per cent screen to body ratio. 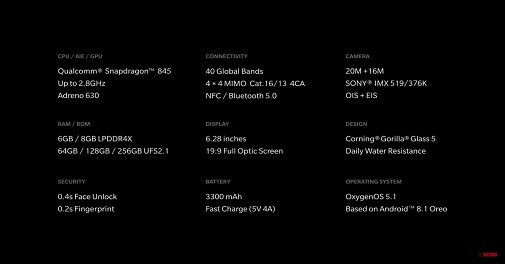 The OnePlus 6 will be powered by recently announced Qualcomm Snapdragon 845 processor with Adreno 630 GPU. The device will be paired with up to 8GB of RAM and up to 256GB of onboard storage. There is a dual camera setup at the rear - which packs in a 16-megapixel camera with an f/1.7 aperture and a 20-megapixel camera. OnePlus claims that the 16-megapixel main camera has a 19 per cent larger sensor, Optical Image stabilization and Electronic Image stabilization for low-light photography. OnePlus calls the 'bokeh' mode as the 'Portrait Mode' and plans to bring the same to the 16-megapixel front camera with a software update. For video capture, the phone supports 4k video in up to 60 frames per second and a super-slow-motion mode for capturing high-definition video at up to 480 frames per second. Weighing 177 grams, OnePlus 6 will be 7.75mm thick and will be available in three colour colours - mirror black, midnight black and a limited edition silk white. This device is a dual SIM phone with support for two nano SIM cards on LTE network and other connectivity options include NFC, Type C, audio support via USB and Bluetooth 5.0. For security, the device will have a fingerprint scanner at the rear and will also feature Face Unlock. The phone also supports gestures that can replace the navigation keys while offering more screen estate. The OnePlus 6 is capable of competing against the recently launched Nokia 8 Sirocco, Samsung Galaxy S9, Galaxy S9+ and Honor View 10. Available in three variants, the 6GB variant with 64GB onboard storage has been priced at $529 (roughly Rs 35,800), the 8GB variant with 128GB storage has been priced at $579 (roughly Rs 39,200) and the 8GB variant with 256GB storage will be available for $629 (roughly Rs 42,600). India being one of the key markets for the company, OnePlus is hosting a launch event in Mumbai on May 17, where the Indian pricing of the devices will be announced. The event will start at 3:30 pm. The device will go on sale at pop-up events across eight Indian cities on May 21 and May 22.